One oft-overlooked aspect of wilderness living is rest. Fire, water, food, shelter, first aid, self-defense, and signaling are covered in detail, but getting a good night’s rest is hardly mentioned. I suppose the expectation is that you just need to tough it out, and if you only get an hour’s sleep because you’re cold, wet, and uncomfortable… well, so be it. But that’s not how it’s always been. If you read the writings of any of the old woodsmen like Horace Kephart, Nessmuk, or Dan Beard, they all heavily emphasize rest. Every one of them has something to say about how to construct a shelter that breathes well while trapping plenty of warmth, or laying a bough bed that’s comfortable to sleep on. A good night’s sleep really mattered to these guys. And since they spent more time in the woods than most of us ever will, I believe it wise to listen to what they’ve got to say. Making it through a wilderness survival situation successfully, especially a long-term one, is the culmination of a lot of small things executed correctly. For instance, it may not seem important to put your fire far enough away from your shelter (one big step, if you’re wondering) to minimize the risk of your shelter catching on fire. But suppose your shelter does burst into flames while you’re sleeping. While it likely won’t kill you outright, you’re going to get some nasty burns, you’ll probably lose some of your gear, and you’re going to lose your shelter in the middle of the night. All three of those things could easily be fatal. And they can be prevented with that one simple rule of thumb. Small thing. Executed correctly. Getting enough rest is similar – it may not seem significant on the surface, but when executed incorrectly, the results can be disastrous. While getting proper rest may not seem important, consider the consequences if you don’t. One night probably won’t affect you too much. You won’t be at your best, but you’ll be alright. But more than one night in harsh conditions with little or no sleep, and things start to unravel. The rule of thumb is that the average human can go 30 hours without rest before bad things start to happen. Your decision-making capacity will be affected, and you’ll begin to make bad judgment calls that may put you and those under your care in danger. Your short-term memory will suffer, and you’ll be much more likely to misplace important items of gear, or forget where important resources are in the woods. Your physical recovery will be impeded, and the already existing stress on your body from a greatly reduced calorie intake and temperature extremes will be exacerbated. You will become more vulnerable to hypothermia or heat exhaustion. Your motor skills and reflexes will suffer, making the possibility of accidental injury far more likely. Your situational awareness will drop, leading to missing out on important cues in the weather, signs of wildlife (whether it’s for hunting or trapping, or defending yourself from it), wild edibles, environmental dangers, etc. This is what is meant by “survival mindset.” It is the difference between having the mental fortitude to get up and forage for more firewood instead of letting your fire die, curling up in your space blanket, and freezing to death. It is the difference between hiking up to the top of a mountain to build a signal fire to attract rescuers versus staying at your camp and hoping for the best. You get the idea. When you’re well-rested, even if you’re cold, miserable, and calorie-deprived, it’ll be easier to take action and shoulder the burden of responsibility for saving your own life in a situation where all the odds are stacked against you. So what can you do to ensure you rest well in the woods? - Stay off the ground. The ratio for creating a bed out of leaf litter, boughs, palmetto fronds, grass, or any other natural material is 4:1. Meaning that for every 4” of material you stack up, it will compress down to 1”. We recommend stacking up at least 24” of material for your bed at the absolute minimum. This will leave you with a 6” barrier between you and the ground. More is better. If it’s really cold, double that. - Stay out of the wind. When building a shelter, whether it’s a fast-action tarp shelter or a natural shelter, try your best to ascertain the direction of the prevailing wind and put the back of your shelter towards it. Also, try not to construct shelters on ridgelines or mountaintops where winds will be fiercer. Ideally try to find a small, protected draw or ravine on the leeward side of the mountain, out of the wind. - Stay dry. If you’re building a primitive shelter and have any sort of synthetic barrier, use it. Even the cheapest Wal-Mart rain poncho is superior to most natural materials for keeping water out of your shelter. Use a space blanket, casualty blanket, poncho, tarp, or whatever you’ve got to line your shelter. It’ll also help trap and reflect heat. If you don’t have it (or even if you do), pile up a minimum of 24” of natural material on your shelter. There are still no guarantees you’ll stay dry, but this will help. - Stay warm. In my opinion, the best shelter designs are the ones where you can lay parallel to a fire and keep your whole body warm. Build a long fire with a couple logs and a reflector wall to throw the heat back into the shelter (and block more wind), and you’ll be snug as a bug. The Kochanski Supershelter, which we’ve written about many times, is without a doubt the best shelter design for warmth around, if you’re carrying the materials to build one. 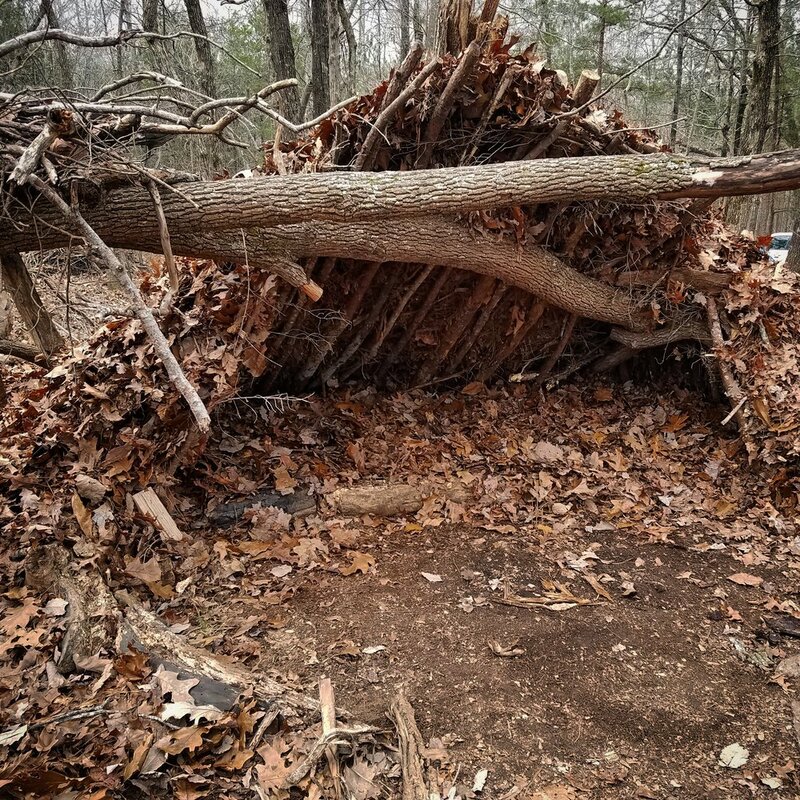 If you incorporate all of these priorities into your shelter building, an unexpected experience in the woods will become a lot more bearable. I’ve spent plenty of nights in properly built natural shelters with well-laid beds and good fires, and I can attest that it’s some of the best sleep I’ve ever had, in the woods or not. Man’s ultimate survival tool is his mind, and you need to do everything you can to keep it sharp. If you can rest well, you can think well. Prioritize it, and securing the rest of your survival priorities will become a lot less difficult. Want to learn what we talked about in this post in an interactive, hands-on environment? Join us for Sheltering Essentials on Saturday, February 9th from 9am-7pm! We’ll be building modern fast-action shelters as well as primitive natural shelters, and a whole lot more. Learn more and register now at https://www.sarcraft.com/course-registration/sheltering-essentials-registration!